Today is a great day for a big announcement. 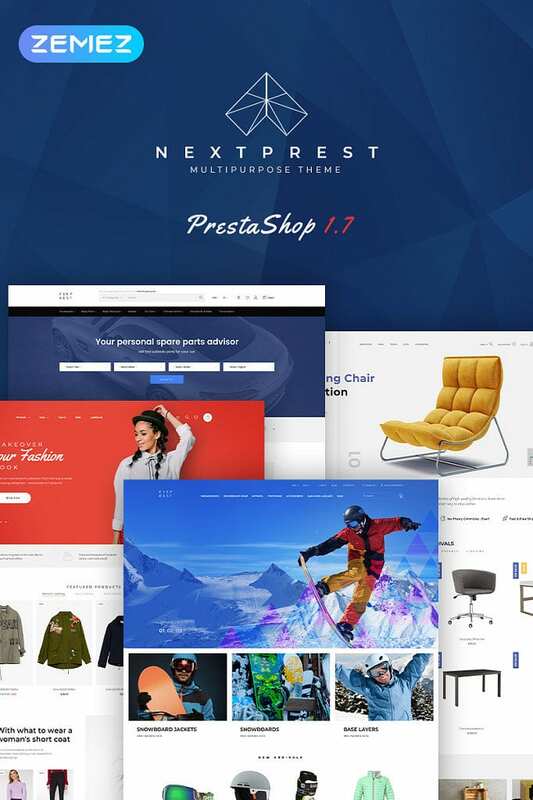 Meet Nextprest – a fresh revolutionary multipurpose PrestaShop theme. Nowadays, the eCommerce niche is all about innovation and multifunctionality. And PrestaShop is boosting up to the next level. This ready-made solution is built with the hottest web design and the latest functional trends in mind. Nextprest is considered to be a great fit for literally any type of online business. This versatile theme has a rich variety of pre-built skins for the most common niches. For example, it is perfectly suited for building a powerful website for any business: apparel, fashion, auto spare parts, sports clothing. In addition, the theme is equipped with a pack of pre-made pages and elements for a successful eCommerce project. Thanks to the multiple page layouts, a variety of pre-built design and marketing elements, Nextprest surely is a powerful tool to create a unique website with. Soon, Nextprest will widen the number of its topics to 10. And once you buy this theme, you will get all upcoming updates at no cost. 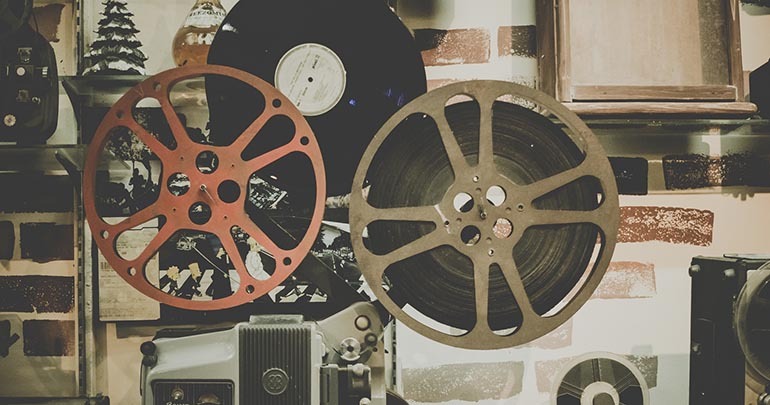 So let’s take a closer look at the variety of functions Nextprest has under its hood. A theme is built on a basis of JX Mega Layout module. Owing to it, Nexprest makes it possible to create and modify different content blocks including header, footer, banners and custom elements, according to your taste and any requirements. The JX Mega Menu module allows creating and organizing a categorized menu. You can add banners, links, insert custom blocks, in order to create smooth website navigation. One more cool module that a Nextprest has is JX One Click Order. As it is clear from the title, it allows making a purchase within a couple of seconds. Buying online has never been as easy as with a help of JX One Click Order. It is not a secret, that the page loading time really affects SEO. To help your website get a faster load time, Nextprest has got an Accelerated Mobile Page module. Mainly, it improves a website performance for mobile devices. AMP allows a faster load of mobile pages, thus providing your customers with the pleasant user experience. It is a well-known fact that blogging is a good option to create a communication between you and your customers. In blog posts, you can tell about the product news, upcoming sales, new collections or publish user-generated content. And Nextprest has a JX Blog module to help you. Owing to this module, you will be able to get closer to your audience, increase the traffic and improve the SEO score of your website. Nextprest also has a solution that will protect your website. There is a JX Security Pack, that includes JX Security Panel, JX Security User and JX Security Watermark modules. This pack allows safeguarding your website on multiple levels. For instance, you can put a watermark on pictures, lock the opportunity of posting content, etc. But that’s not all. 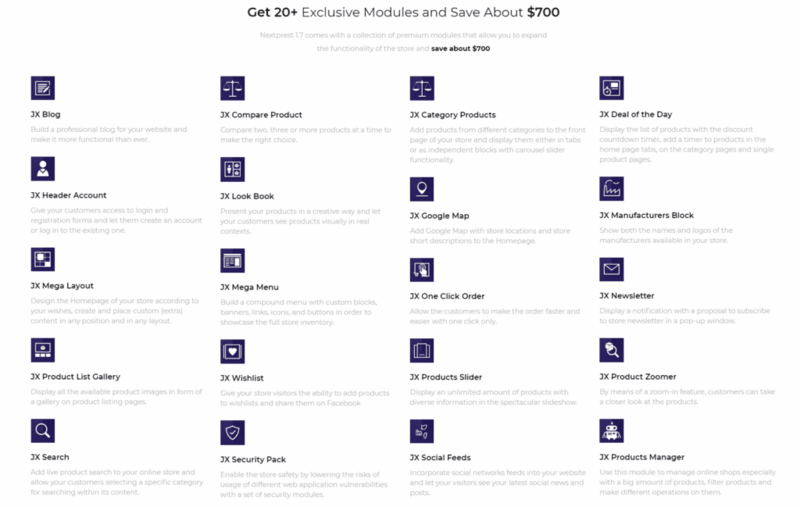 A Nextprest offers you also 20+built-in premium modules, Google services integration, social media panel, Wishlist, and Compare options. In addition, it supports multiple currencies and languages, to make it a lot easier to expand your business far across your country. Surely, Nextprest also has in-depth documentation, to give you detailed instructions on how to set up and customize your theme. Considering all things written above, we can say that Nextprest is far more than just a promising theme. It is a super powerful tool, full of pleasant surprises and pre-built sophisticated design elements. And there are many awesome updates to come. 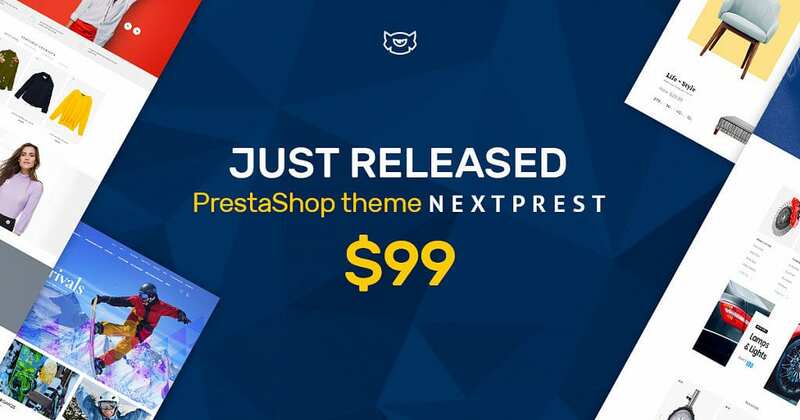 Take advantage of the top-notch website performance with a Nextprest PrestaShop theme! By the way, there is a chance to grab any theme with a 38% discount. Don’t miss an opportunity to get a new design for your website!